In the ten years we have been taking meticulous care of Jessie, our Yellow Lab, we have not found a more caring and professional vet clinic than this one. Keep up the great work. 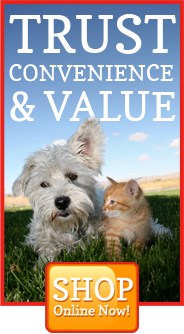 If you live in the Wabash Valley area, then you have picked the perfect site to find a veterinarian. Your pet's health and well being is very important to us and we will take every step to give your pet the best possible care. Four Loving Paws Veterinary Services, Inc. is a full service animal hospital and will take both emergency cases as well as less urgent medical, surgical, and dental issues. We are experienced in all types of conditions and treatments. Beyond first rate pet care, we make our clinic comfortable, kid-friendly, and a very calm environment so your pet can relax in the waiting room and look forward to meeting their doctor. We have a number of resources for you to learn about how to take better care of your pets. Browse around and look at our articles and pet videos. The best veterinary care for animals is ongoing nutrition and problem prevention. If you want to ask a question call (812) 448-1415 or email us and we'll promptly get back to you. Our office is very easy to get to, and you can find directions on our Contact Us page. You can also subscribe to our newsletter which is created especially for Brazil pet owners. In between your veterinary visits, your pet will benefit from you reading these free informative articles. Full-Service Pet Care, including medical, surgical, dental, nutritional, emergency, and specialist referral when appropriate. A Veterinary Medical Team that is knowledgeable, caring, friendly, efficient, and committed to quality pet-health care. A Medical Facility with modern equipment and supplies for offering unsurpassed medical and surgical care for pets, in a pleasant, comfortable, and healthful environment. Client Education on matters concerning their pet's health. Preventative Medicine which stresses the control of disease by using steps such as vaccinations, parasite control programs, dental care and proper nutrition.